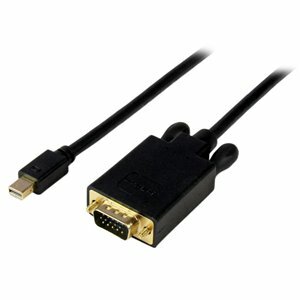 Connect a Mini DisplayPort-equipped PC or Mac to a nearby VGA monitor/projector, with a short 3ft black cable. The MDP2VGAMM3B active Mini DisplayPort to VGA converter cable lets you connect your Mini DisplayPort-equipped desktop or laptop directly to a nearby VGA monitor or projector, saving the expense of additional adapters while eliminating the clutter of excess cable.The adapter cable is compatible with Intel Thunderbolt, when connected directly to a supporting DisplayPort over Thunderbolt I/O port. Plus, because the converter cable supports video resolutions up to 1920x1200 you can convert a DisplayPort video source to VGA without sacrificing video quality. The MDP2VGAMM3B active Mini DisplayPort to VGA converter cable lets you connect your Mini DisplayPort-equipped desktop or laptop directly to a nearby VGA monitor or projector, saving the expense of additional adapters while eliminating the clutter of excess cable. The MDP2VGAMM3B is backed by a 2-year StarTech.com warranty and free lifetime technical support.